If you think distracted driving is bad — you’re right. And it’s an issue for professional truck drivers, too. April is Distracted Driving Awareness month, and several new studies show the problem is getting worse. The findings follow National Safety Council estimates that automotive fatalities in 2017 topped 40,000 for the second consecutive year. Distracted driving occurred in 36% of trips nationwide over the past six months, up 5% from the same time last year, according to an analysis of 65 million vehicle trips by Cambridge Mobile Telematics. The rise is due to the prevalence and use of smartphones. “People are more addicted,” said Katherine Wellman, Cambridge vice president of marketing. And Finder US reported that 45% of all drivers acknowledged they talked on their phone while driving. Older folks generally pay better attention while driving, with 46% of baby boomers saying they concentrated while driving, compared with 38% of Generation Xers and 35% of millennials, according to Finder’s February survey of 2,001 American adults. Studies have shown that professional drivers are safer drivers than nonprofessionals. Large trucks have an overall crash rate 29% lower than other vehicles, and the number of large truck-involved fatal crashes fell 32% from 1985 to 2015, according to the Federal Motor Carrier Safety Administration. Also, most research studies show that passenger car drivers principally are at fault in about 75% of all fatal truck/car accidents. Still, distracted driving is a problem for the trucking industry, and a recent study found that a subset of drivers are responsible for much of the bad behavior. The "SmartIQ Beat Snapshot on Distracted Driving” from SmartDrive Systems found that those drivers that show the most distraction, the worst 25%, are much more likely to engage in dangerous driving behavior. Those drivers are 87% more likely to drive 10 mph or more over the speed limit, 83% more likely to roll through a stop sign/red light and 36% more likely to be involved in a near collision. They also see an average 6% lower mpg. SmartDrive created the snapshot through an analysis of its database of more than 180 million driving events and accompanying continuous telematics data for the period February 2016 through January 2017. San Diego-based SmartDrive provides video systems and analysis for fleets and drivers. When analyzing all truck drivers, SmartDrive found that those distracted by mobile devices are at the highest risk for problems compared with drivers distracted by other practices, such as smoking or paperwork. For instance, truck drivers that have been in at least one collision are 94% more likely to be distracted by talking on a hand-held mobile phone and 85% more likely to be distracted by texting or dialing a mobile phone than their “noncollision” peers. Also, drivers distracted by mobile phones are three times more likely to exceed the speed limit by 10 mph or more and 2.7 times more likely to ignore a stoplight. 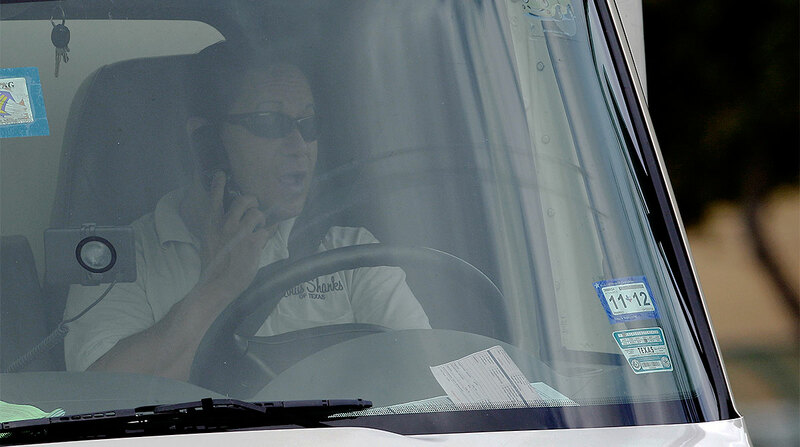 The rising use of phones by truck drivers led FMCSA in 2012 to enact stricter penalties for professional drivers covering cellphone use while driving, including holding, texting, dialing and reaching for the device. Last year, the civil penalties for these violations rose to a maximum of $14,739 for motor carriers and $3,685 for a driver.